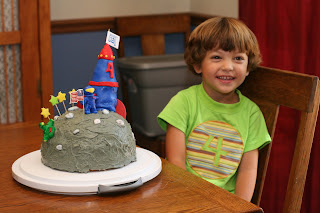 Ben and Sam: Happy 4th Birthday Benjamin! Ben was so excited this morning, our little guy that USUALLY sleeps in past 8 was up at 6:30 this morning telling us that it was daytime, the sun was up, and it was time to wake up. He's had a great birthday, if i say so myself. This morning Pete made him BLUE pancakes at Ben's request. We took him to the park and he caught several fish (a little better luck then yesterday's adventure for those of you that received that email). This time there was limited running and no screaming, well until I saw one poop on Pete.. then there was a little bit of a shriek. We returned home long enough to regroup - WASH UP, and head out to play mini-golf. Then cake, presents, a nap, and now more play, pizza making, and a movie this evening. Ben!! I'm sorry we didn't get to talk to you on your birthday! I was half-marathoning in Chicago so I can stay lean and mean like your mom and dad. I'm glad you had a great day, and I'm sure you've got an exciting (though decidedly cloudy) month ahead of you.